I was heading south toward Imperial Beach on Interstate 5 when a group of sailboat masts caught my eye in the distance. I made a point to check my surroundings so I could find where they were on my way back home later in the afternoon. 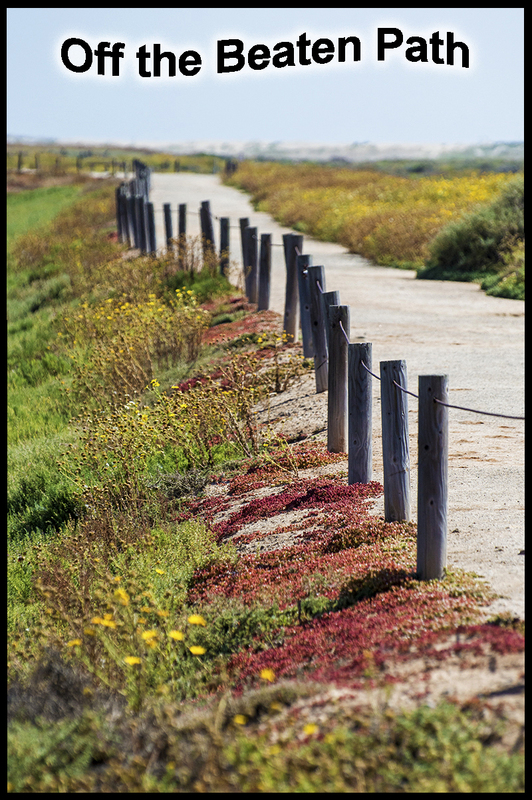 It was an exploration type of day and we were an hour or so from home on our way to the Tijuana Estuary. I knew with the days getting longer, I had plenty of time to stop by and see for myself where those boats were moored. 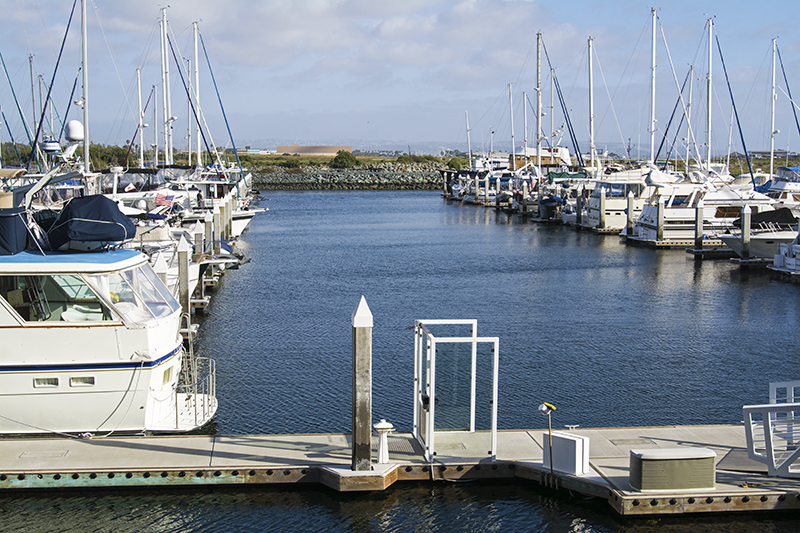 Later in the afternoon, we did find the tiny Pier 32 Marina and as it turns out, it is basically for slip rentals. If you have a boat this is the place for you. 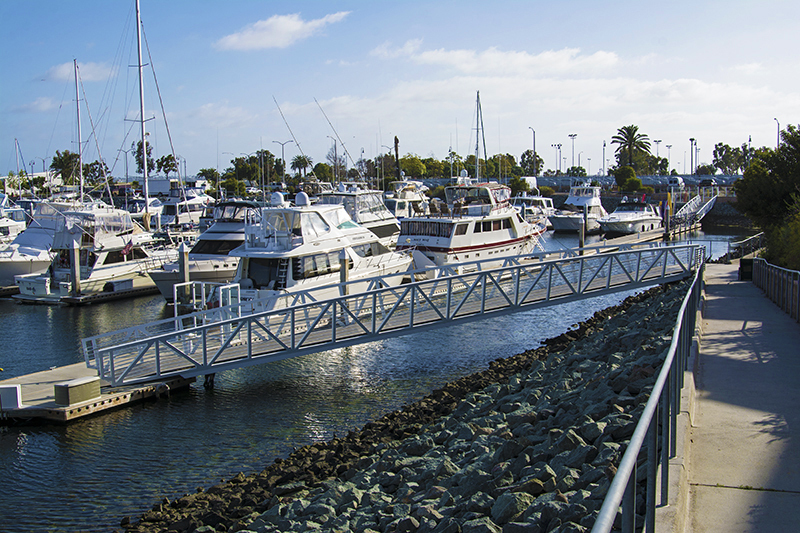 Located in National City, they bill this marina as one of the finest in San Diego with its first class amenities and state-of-the art facilities. 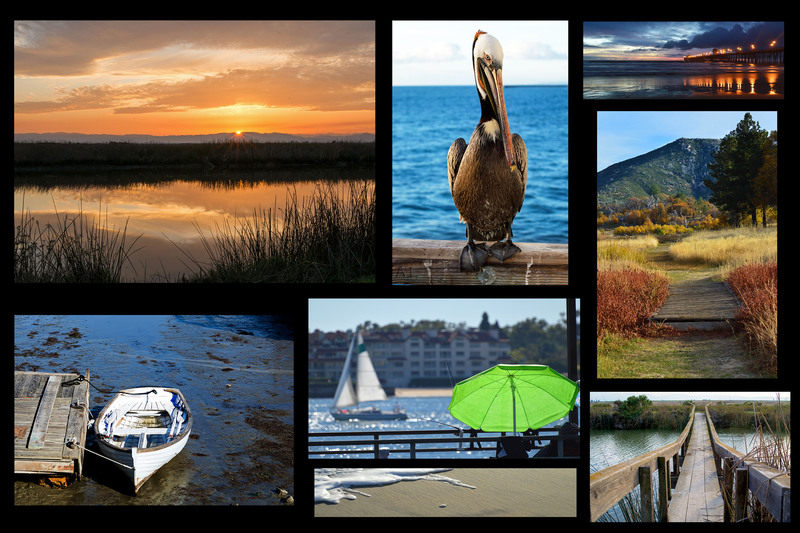 It was off the beaten path just enough to make you feel like you are getting away from it all while enjoying the life of living on a boat. Off the beaten path just enough. Interstate 5 in the background. 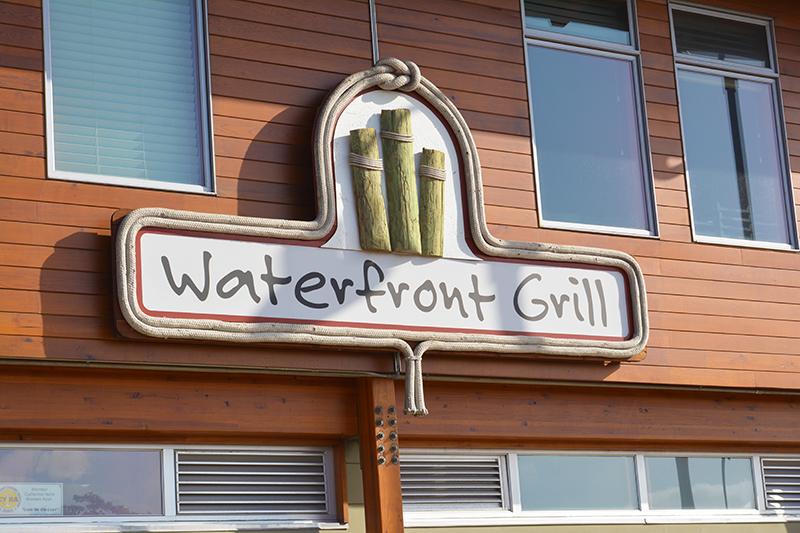 Most of the waterfront caters to the 250 slip renters but there is a sizable public restaurant on site, aptly called the Waterfront Grill. 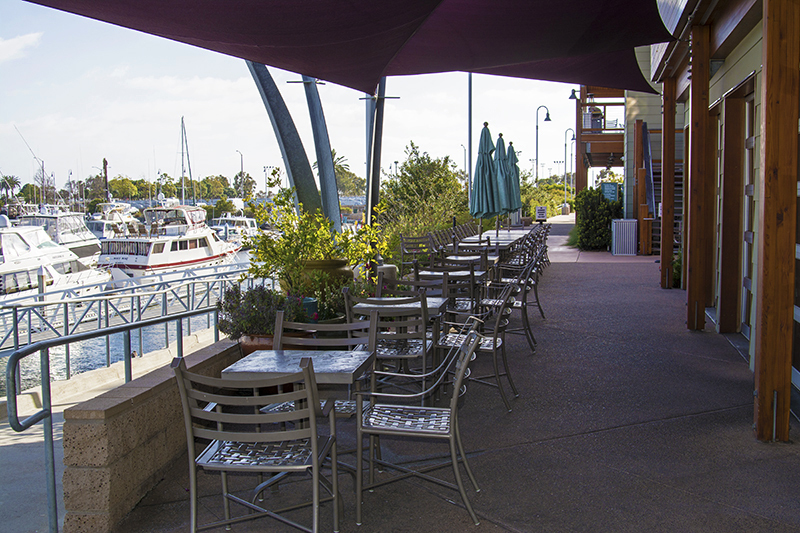 Voted “Best of South County for Outside Dining Experience”, the restaurant has plenty of outdoor seating and overlooks the clear blue water plus the boats below. 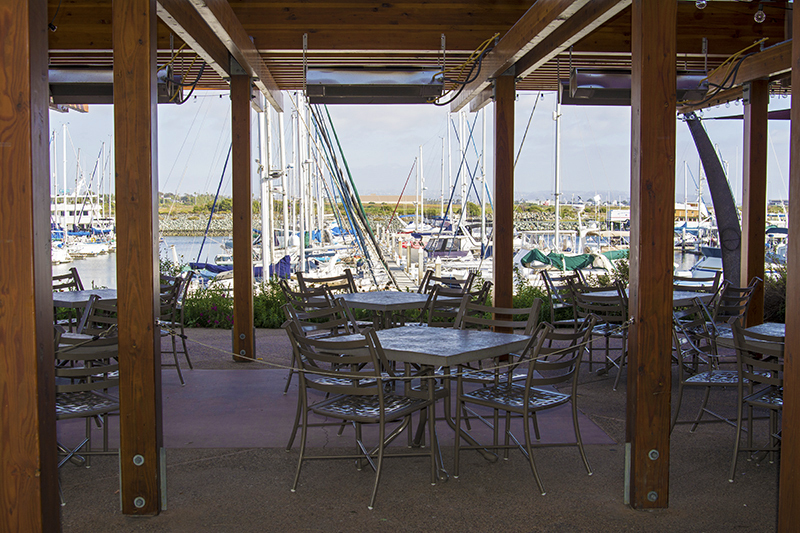 Besides the relaxing atmosphere, the restaurant has affordable prices featuring: breakfast fare, gourmet sandwiches, yummy side dishes, fresh ingredients, and happy hour cocktails. It was closed early on this Mothers Day holiday when we visited but I am sure it is full of life on a normal Sunday. We heard kids splashing around in a pool so our curiosity got the best of us and we got out of the car to explore a little more. As it turns out, the pool and Jacuzzi are for the boat residents as well as a nice sized gym, laundry room, a beautifully decorated bathroom with showers, a putting green, basketball hoop, and a 345 square foot lounge. The lounge is available for renters and comes complete with a full coffee bar, mini kitchen, couches, coffee tables, and a huge flat screen television. 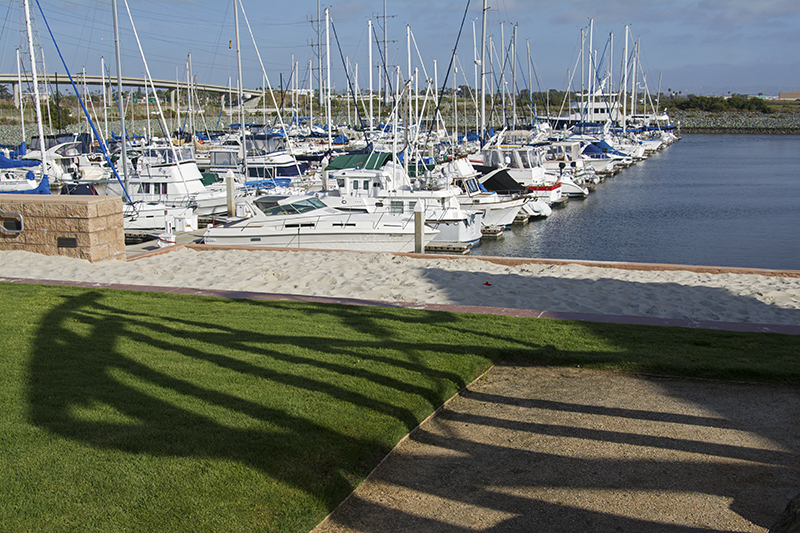 A grassy area, putting green, and private beach just for the slip renters. Just down this walkway sits the pool and Jacuzzi and all the other amenities. The area is protected by security cameras and has security officers on staff certain parts of the day. I am sure the mooring fees are a lot more than an average harbor although if you can afford the fees, it seems well worth it. I am glad I stopped by as it lived up to its billing and it made me want to work harder to make millions so I can moor a boat there. Well actually that may be impossible since I am retiring soon and there aren’t exactly seven digits in any of my accounts. 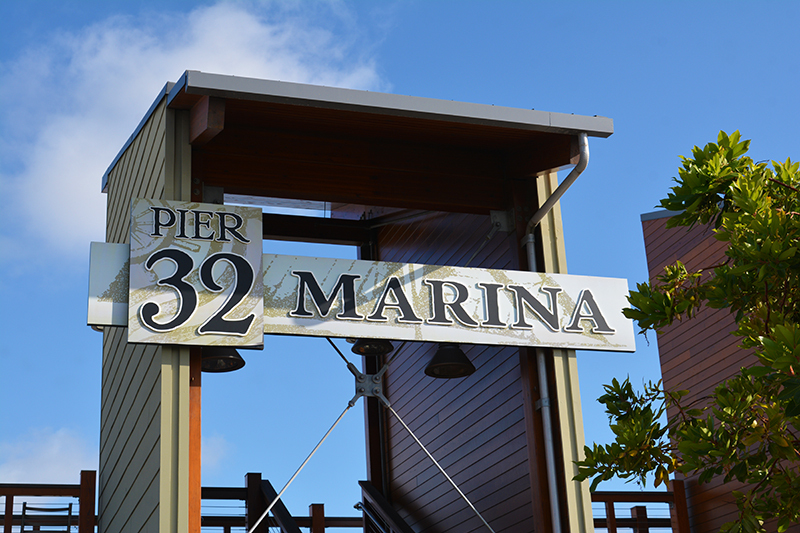 The millions will have to come later when I win the lottery and that is when I will buy a boat to keep it at the Pier 32 Marina! I can dream can’t I? Anyway, if you are out and about exploring your area by the coast, keep your eyes open for a secluded little marina like this one. Take time to sit back in the open air with sea air blowing in your face, and enjoy the sweet aroma of some good food coming your way. 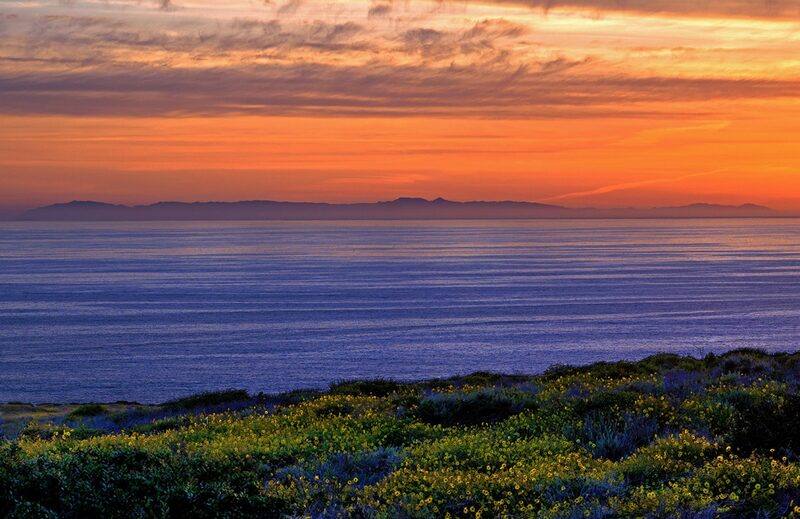 That is California coastal living! 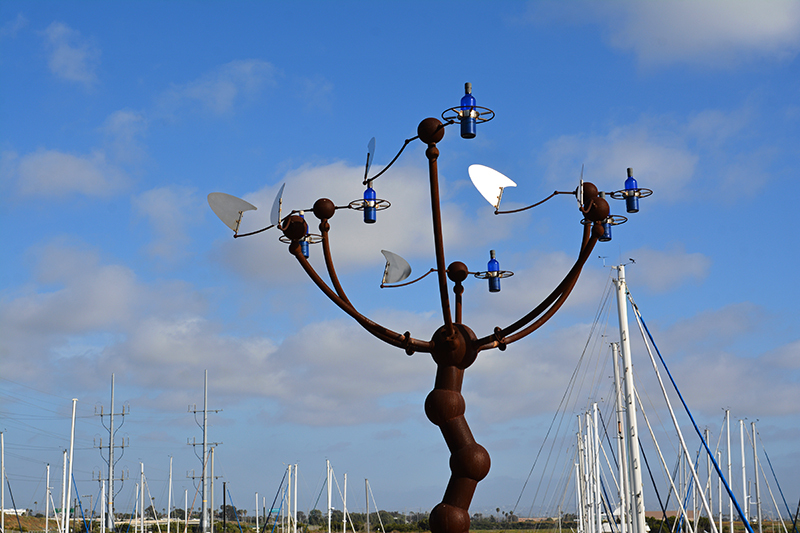 A pretty cool statue at the entrance to the harbor.